When installing a play structure in your yard, especially if you have a structure set in wood chips, pea gravel or mulch, you have to be cautious since it can seriously interrupt the air and the bacteria in your drain pipes. As much as it is a good idea to have a play structure set up in your yard, there are also reasons why doing so is bad idea. If you really want to make the structure safe, you need to dig about 1 ft. off the ground and put plastic sheeting. Pour enough wood chips, pea gravel or mulch. Doing this enables the footings of the structure to be properly hidden so that no one would play on them. On top of that, it also adds stability to your play structure. The downside is that it can cut-off the bacteria in the pipes which is crucial. If the bacteria in your drain field fails to survive, the breakdown process is affected and as a result it can cause a flood of waste. If there are problems with your septic system, it is important that you hire professionals who can do the job and they should have access to the drain field as well as the other parts of the system. Having a play structure makes it difficult especially when you have to move it not to mention that it takes a lot of time to do it. A play structure can be quite heavy. 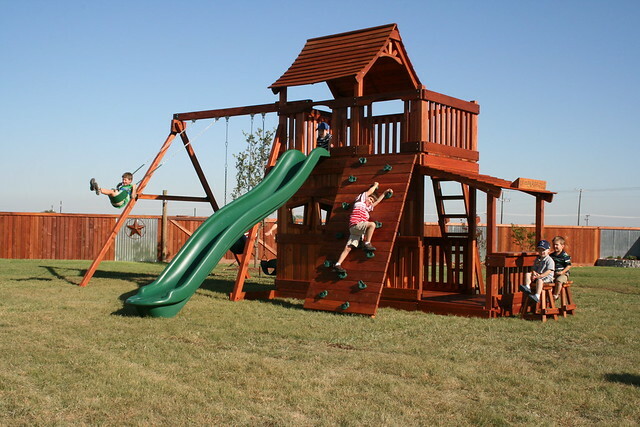 Although there are downsides in having a play structure, there are ways for you to still install it even if you have a septic system in your yard. Make your own research and talk to professionals for advice. For sure, they can find a way to help you prior to installing a play structure. Kids love to play and if you are planning to have a play structure in your yard, you do not just consider what your kids like. Keep in mind that these structures may also reach the septic system. If you have one in your yard, it is essential that you are aware as to how sensitive a septic system is. Septic systems are very important as they put chemicals and waste into your home’s drains. There are cases where septic tanks can be clogged and the drain pipes can be cracked or clogged. In the septic tank, it has certain bacteria that are responsible in breaking down the waste. This is basically the first breakdown phase and to ensure that the colony of bacteria survives, the tank should be airtight. What happens when the tank cracks is that air comes in. Bacteria would start to die and the first breakdown process will be affected. In the drain field, it contains pipes and inside these pipes there you find groups of bacteria. This is where the second phase of breakdown comes in and it makes the water usable for plants and sod. In order for these bacteria to live and to effectively break down waste they need some air. Without air, bacteria will die and the process will be interrupted. This can result to serious health as well as environmental risk.